"Among all unimportant subjects", said Pope John Paul II, "football is by far the most important". While the former pontiff may have recognized an almost religious fervour in the beautiful game's followers, he probably didn’t consult many economists before making his pronouncement. That’s because the general consensus is that hosting a World Cup is not really worth the investment. Although it’s tempting to accuse economists of being bad sports, most of the evidence suggests they are right. Organizers of this summer’s World Cup in Russia have predicted that the total economic impact of the tournament could be as high as $30.8 billion by 2023. The anticipated effect is created by spending on construction and general investment. 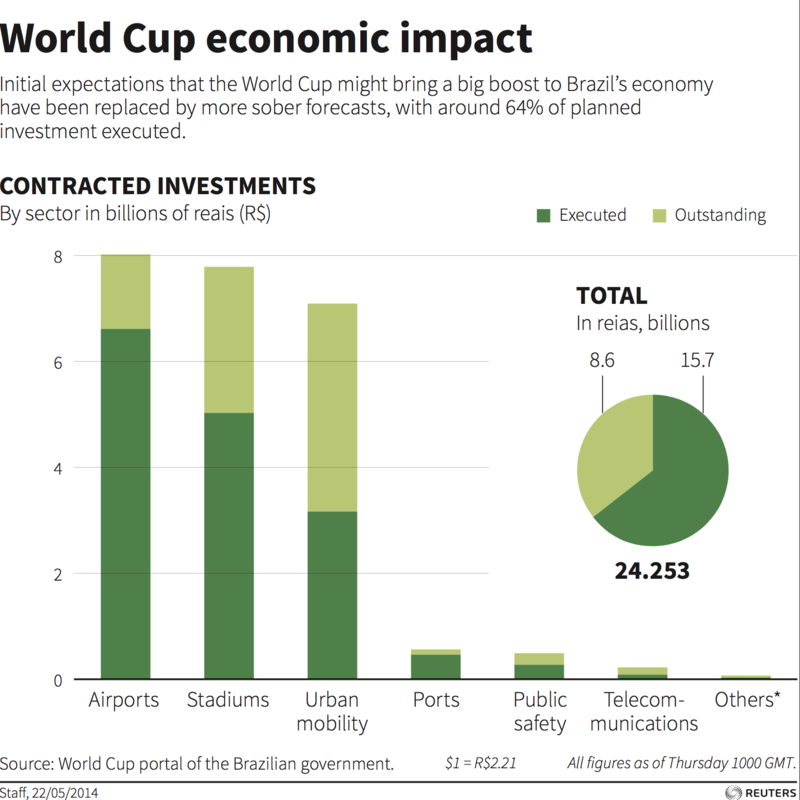 Indeed, the case is often made that hosting a World Cup, or any other major sporting event, can boost a nation’s economy by attracting tourists, initiating important infrastructure projects and showcasing countries and cities as good places to do business. But the costs of achieving those noble goals appear to outweigh the economic benefits they produce. Why? The first reason is simply the opportunity cost of hosting a major sporting tournament. The money spent on new or upgraded infrastructure is likely to be more wisely used in long-term investments in critical areas of the economy. Large-scale construction is typically justified on the grounds that it will boost economic growth in the short term, and improved infrastructure will bring long-term gains to society. Though this may be true - an increase in government spending should lead to a rise in Gross Domestic Product - the World Economic Forum’s Inclusive Growth and Development Report argues that focusing on inclusive growth is more important. This means spending to deliver both economic growth and broad-based, sustained improvements to living standards. Unfortunately, sporting infrastructure is expensive to construct and run, takes up scarce and high-value real estate, and is often difficult to use with enough frequency to cover maintenance costs. A stadium is not really essential to the economic well-being of a median worker. So if tournaments are a convenient excuse to construct and improve tangential national infrastructure, why not derive equivalent benefits at a lower cost by eliminating stadia from the equation? In his argument against hosting mega sporting events, economist Andrew Zimbalist lists examples of the white elephants left barely used in host cities once tournaments have ended. Before the 2010 World Cup in South Africa, low-income residents living in settlements near tournament sites were reportedly evicted in an attempt to improve the country’s image on the national stage, leading many to question whether the money would have been better spent on improving impoverished communities instead. Brazil’s most expensive World Cup stadium is now a parking lot, and the country’s preparations for the World Cup cost an estimated $11-14 billion. The National Court of Auditors of Brazil concluded that public spending on the World Cup would be "enough money to pay the entire country’s annual Bolsa Familia [social welfare] bill twice over". When measured against an expected economic impact of $3-13 billion, it’s hard to argue that taxpayers saw a fair return on their investment. Major sporting events certainly attract thousands of sports fans. But they may disrupt established tourist flows and end up driving traffic away from popular sites and attractions. As to whether these tournaments boost overall tourist numbers, the evidence may point to the contrary. In both Beijing and London, year-on-year visits decreased in their Olympic years, in 2008 and 2012 respectively, while the UK’s most popular museum, the British Museum, saw 22% fewer visitors during the month that the games were held. The British government's own evaluation after the Olympic Games concluded that "there was substantial displacement of regular visitors who were deterred by the potential for overcrowding, disruption and price rises". Moving the goalposts: will footballers pledge 1% of their wages to change the world? If robots are so smart, how come they can’t play football? Even when tourism does increase, it doesn’t necessarily produce a pareto gain, because there is a spend associated with attracting visitors. Before the 2010 World Cup in South Africa, it was predicted that around 450,000 tourists would enter the country for the tournament. In the end, only two thirds showed up. Despite the reduced numbers, visitor spend increased by almost a quarter, but at a cost of acquisition to the South African government of up to $13,000. For roughly the same amount, the country could have paid the wages of the entire working age population for a week. Indeed, it’s hard to determine where the money that tourists spend ends up. Hotel prices rise during sell-out events, but wages of service workers do not necessarily go up by the same amount, meaning the returns to capital are likely greater than those to labour. Looking ahead to Russia, analysts anticipate that economic gains from hosting the 2018 World Cup will mainly benefit the tourist industry, but have described them as being so negligible that they are "equivalent to that of a statistical error". Advanced economies should have the edge in generating a financial surplus from competitions, given that their existing sporting, hospitality and mobility infrastructure usually requires only minor upgrades. The 1984 Olympics in Los Angeles are frequently cited as a successful and profitable competition, and the London Olympics produced $5.2 billion in revenue. There are multiple revenue streams that exist for organizers, including gate receipts, merchandise sales, sponsorships and licensing agreements, but by far the biggest income flow comes from television rights. However, the governing bodies behind sporting events are taking an increasing share of these spoils, making it harder for even the most efficient local organizers to make money. 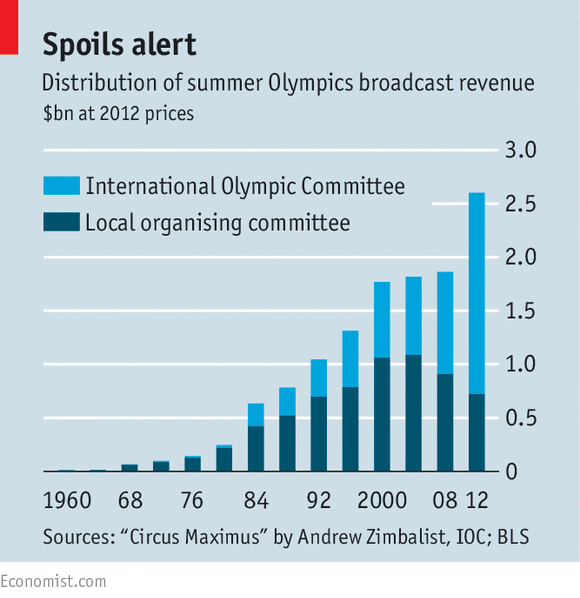 The Economist shows that the International Olympic Committee (IOC) now takes more than 70% of television revenue from the Games, up from 4% between 1960 and 1980. Soccer’s governing body FIFA generated almost $5 billion in revenue from the 2014 World Cup, about half of which came from television rights, despite them contributing nothing to the costs of staging the tournament. All this doesn’t mean that hosting World Cup is completely pointless. Major sporting events are one of the few things that really bring the planet together. Sport is a powerful tool to bridge societal divides. The most recent Winter Olympics showcased the ability of sport to mend differences when athletes from North and South Korea marched under a common flag. And it’s not completely fair to reduce these events to hard numbers and statistics. Tournaments have a feelgood factor, and inspiring stories of success can encourage children and adults to take up sport. Goldman Sachs has even shown that the stock market goes up in both the host country and the country that wins the World Cup - at least in the short term. Ultimately, many sporting hosts are not too focused on the cost of the events. They use a World Cup or an Olympics to send a signal to the rest of the world. China, for example, is developing its sports industry as an extension of its diplomatic policy. As its economy diversifies, its role in the international arena is growing. A process that started with the 2008 Olympics was followed by huge investment in Chinese football, and will continue long beyond the 2022 Winter Olympics, which Beijing is hosting. There is even a suggestion that this might work, with one study showing that nations hosting an Olympic Games experience an increase in trade. But even countries that bid to host but lose see their trade go up, suggesting that the message they are open for business, rather than the tournament itself, is what really counts. For Russia this summer, it’s hard to work out whether its role as World Cup host is part of a nation-building strategy or simply a matter of circumstance. When the country began bidding to host this year’s tournament, its capital Moscow had just hosted the Champions League final and the national team had advanced to the semi-finals of the European Championship. Could it be that President Vladimir Putin simply got caught up in the buzz? In the end, as in football, whether you think the World Cup is worth the expense might come down to whether your heart rules over your head. As for who will win it? As former England midfielder Paul Gascoigne said: “I never predict anything and I never will”.